One of the men who founded the iconic band the Beach Boys in 1961 is being named the “energy czar” of a southeast Iowa town. Singer-songwriter Mike Love says the band’s show in Fairfield on Labor Day will be one of the first-ever “green” rock concerts. There’ll be clean energy demonstrations, educational booths on sustainable energy projects and Love says their sound system will be powered by Iowa soybeans. “We’re arranging to have a generator that runs on biofuels,” Love says. “Iowa and the whole middle of the United States should be all in favor of something like that.” He says the event will feature a “bike to the concert” initiative to cut car usage. “We’re asking people to walk, to bike and to carpool and there’s transportation arranged where it’s not just everybody coming in their own car,” Love says. “We’re trying to make it a community plan to stimulate awareness on that.” Fairfield’s Mayor Ed Malloy was named in April as one of the nation’s greenest mayors. 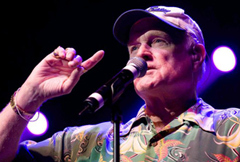 The 68-year-old Love says The Beach Boys’ concert on September 7th will benefit community initiatives as Fairfield works to become America’s Model Sustainable City. The original Beach Boys featured Love, his cousins Brian, Carl and Dennis Wilson, and friend Al Jardine. The band was inducted into the Rock and Roll Hall of Fame in 1988 and received the Grammy’s Lifetime Achievement Award in 2001. The Beach Boys recorded eleven Top 10 singles between 1963 and 1968.